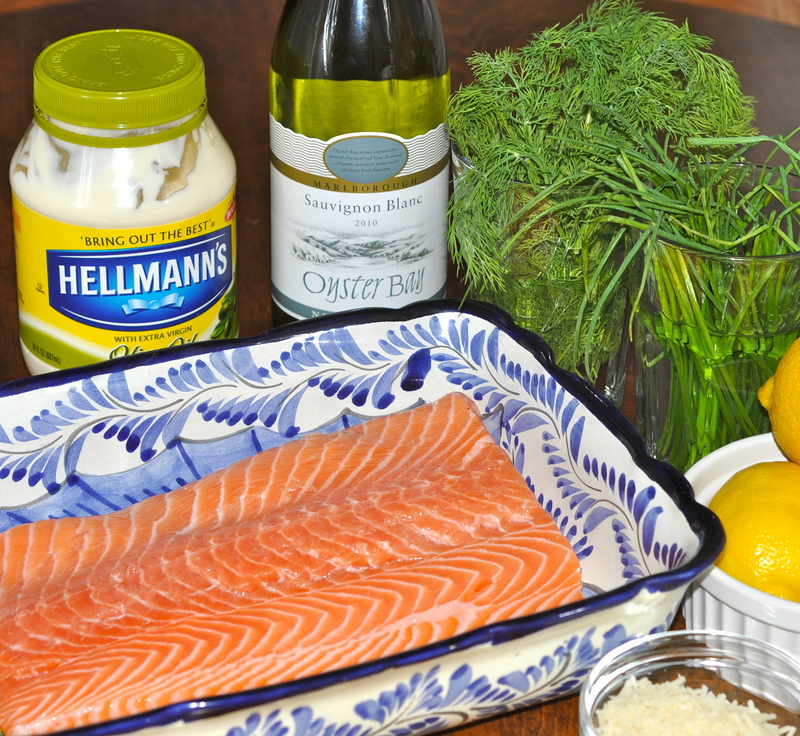 This salmon tastes so good and is so easy to assemble it takes the intimidation factor out of cooking fish at home. My friend Jackie is a budding novice gourmand and can’t wait to try this recipe solo! I have really good luck buying fish at Costco. 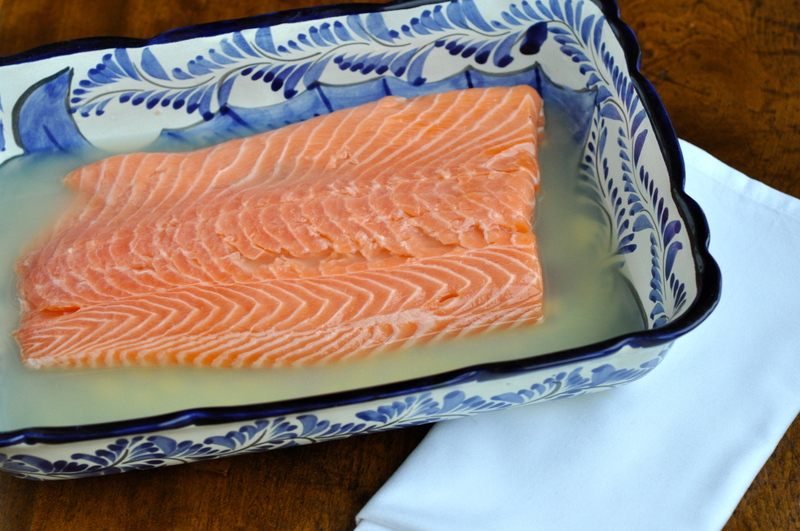 Salmon is usually marketed as either farm raised or wild. I like the farm raised because it tastes a bit milder. 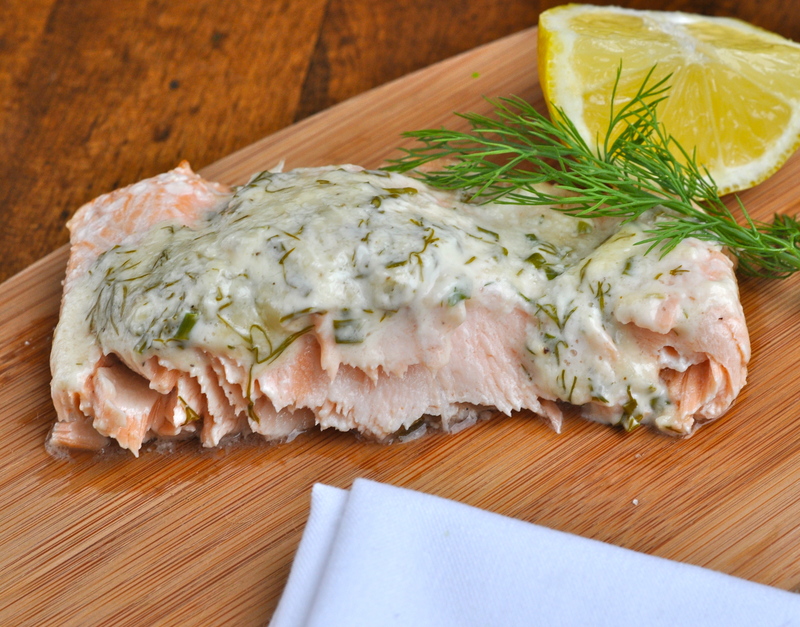 Salmon is a rich, full flavored fish full of those good omega 3 fatty acids to boot. The fish should smell fresh and exhilarating just like the sea. The color should look bright, vibrant and appealing. If it has an unpleasant strong fishy odor don’t buy it – it’s already old. Costco prints the packing date on their fish package which helps immensely to gauge freshness. 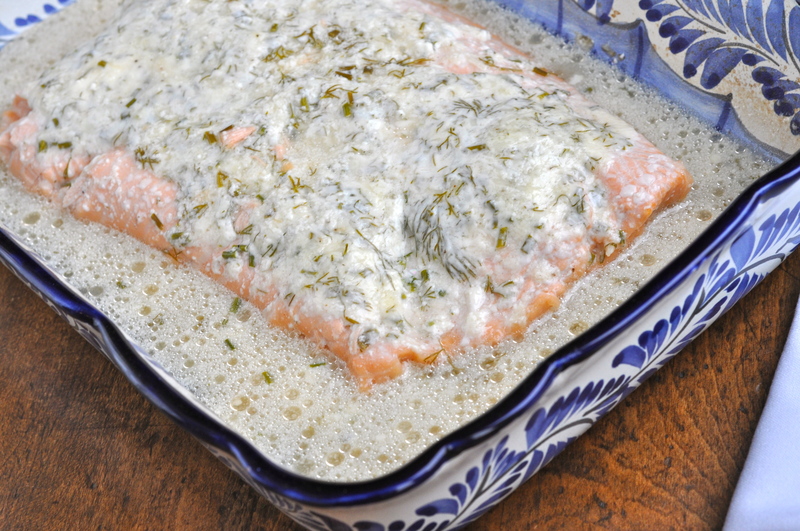 Preheat the oven to 425 degrees F. Place the salmon fillet in a casserole dish. (If it is colder than room temperature add a couple extra minutes when cooking) Make the poaching liquid by combining the wine and lemon juice and pour it over the fillet. 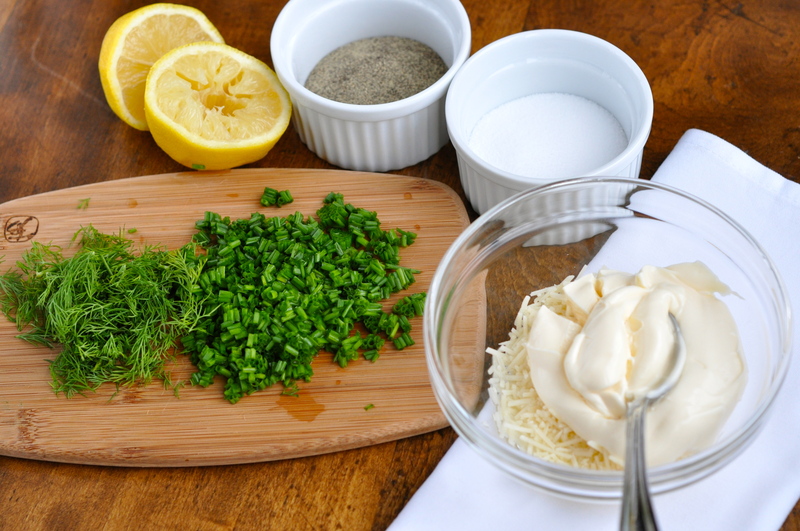 Make a dressing from the grated parmigiano reggiano cheese, mayonnaise, chopped herbs, salt and pepper. If it seems too thick squirt in a little fresh lemon juice. 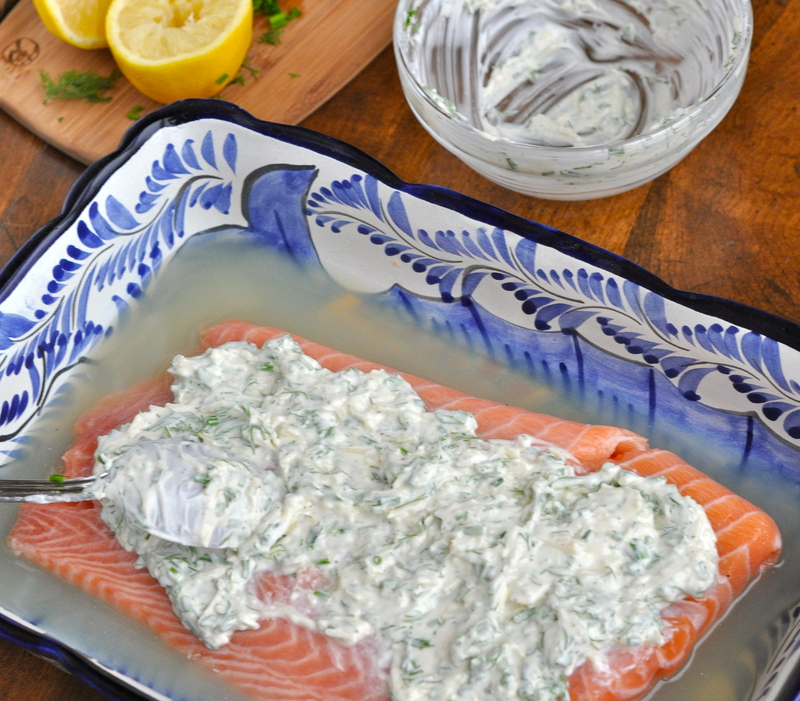 Spread the dressing over the fillet. Cover the casserole with foil. Bake for 20 minutes. After it comes out of the oven leave the foil on and let it rest for 10 minutes. After the foil comes off it will smell absolutely amazing and looks so scrumptious. 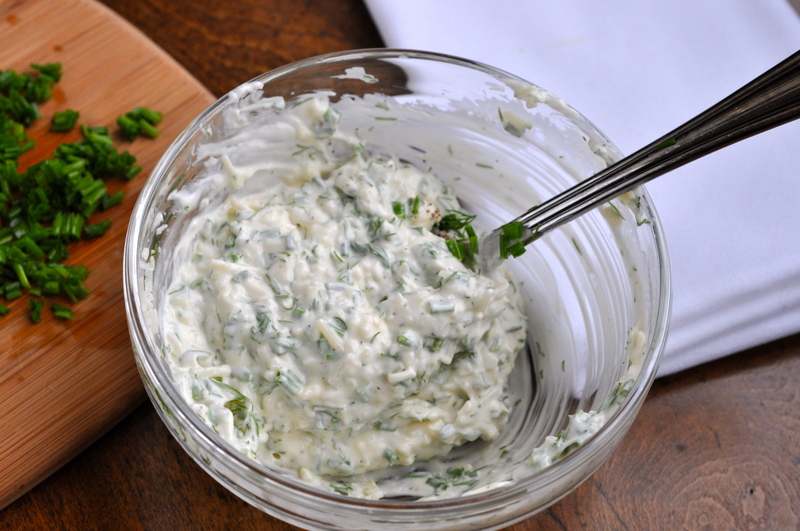 The dressing has melted into the poaching liquid to make the most amazing sauce. Spoon more of the poaching liquid back up over the fillet to blend the sauce. Ta-Da! Nothing intimidating about that. Bon Appetit! As one of the privileged few to have tried this recipe, I can vouch for the yum factor. Deeeee-lish. So that means you are making it soon?!? As you know, Kate and I love salmon, but I usually grill it outside. To change things up we tried your simple recipe, and just loved it. Thanks for making it available. This blog is really fun to follow!